It's a wobbly world and our babies need all the help they can get. Our baby kneepads are designed to help protect our children from the time they start to crawl, walk, then run through the big wide world! 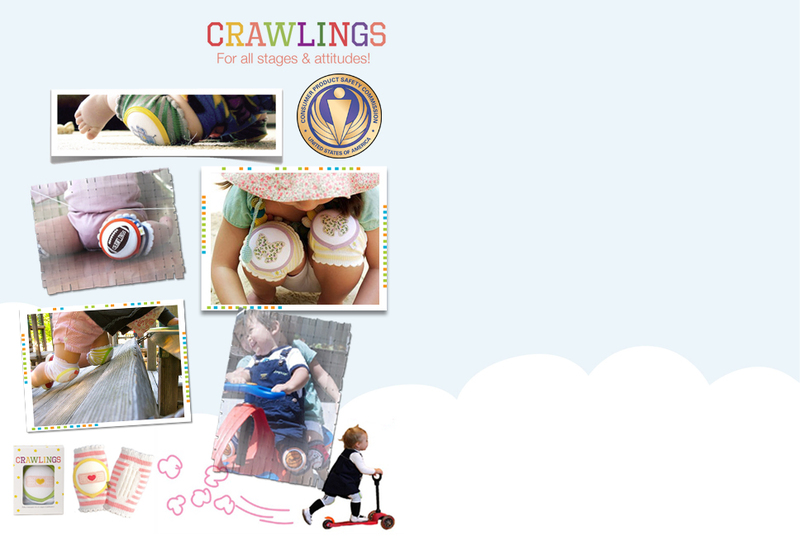 Crawlings kneepads are perfect for indoor use, and even better for the rough and tumble world of the great outdoors. Made of 80% premium cotton, 10% EVA foam, 5% spandex, and 5% nylon, the body of the kneepad is soft, stretchable, and comfortable like a sock to move and grow with the child. The center of the kneepad is made of a lightweight polymer cushion that is soft, flexible, water and UV resistant. The cushion will help reduce the impact to their soft knees and protect their skin from bumps, bruises, and scratches. They are even long enough to protect their shins for the little ones. The back of their knees will have plenty of ventilation and comfort with the vented designs. So parents, let your child go wild! Recommended for ages 6 months to 4+ years. All Crawlings products are CPSIA tested & certified. Machine washable in cold water, low heat or air dry.